One of my classic reading conundrums involves choosing books that take place in the education world. On one hand, it’s not always much of an escape due to my own career teaching. On the other hand, it’s kind of fun to read different perspectives and stories that still share similarities with my own. 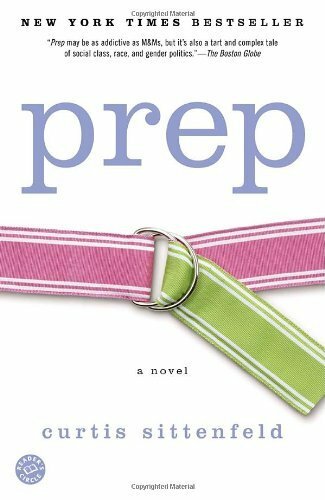 Luckily, Prep has a great balance – I could relate and laugh at many shared insights, but the protagonist’s reality is very unique and significantly different from my own experiences. Sittenfeld is an expert at pulling her readers into her superbly crafted worlds, whether they be education or political, and Prep is no exception. Aside from the interesting setting, I’m also a sucker for a good coming-of-age story (or bildungsroman, one of my favorite literary terms – it’s just fun to say), and Lee’s is just as involving and interesting as a reader could want. I do prefer Alice’s tale of growth and change in another Sittenfeld novel, American Wife, though, but that may be because I simply prefer Alice as a character to Lee. But for the story’s purposes, Lee is still well-developed and empathetic. The novel chronicles Lee’s experience attending an exclusive, prestigious New England preparatory school named Ault. Ault is the location of all of the adolescent trials, tribulations, changes, and challenges you might expect, but Lee narrates the thrilling moments and the excruciating ones with precision and insight. Sittenfeld crafts drama-filled and affecting relationships between Lee and roommates, boyfriends, teachers, and family. Even as the reader may not identify with and support all of Lee’s choices (especially her senior year, when you want to grab her by the collar, aggressively shake her, and help her avoid some of her regretful decisions! ), she is still an empathetic character with depth and acumen (and realistically, don’t we as adults reflect on our teenage selves in much the same way? Happy and proud of some of our choices, yet knowing there are things we would probably change? In that way, I’d say most readers will relate to Lee’s journey). Through the good and the bad, the tale is experienced by a young narrator, but it’s told from the vantage point of an adult, more mature Lee, so there is a great balance between perspective and naivete. The characters are well-drawn and varied, and for the most part, the plot follows a traditional timeline – the four years Lee is at Ault – with a well-defined, involving pace. There are indeed a few majorly aggravating moments, but in some ways, this proves the author’s skill in making her readers care. There are also a few slower-paced sections, but I guess you could say that pace somewhat mimics the way adolescence seems to fly by one moment and mercilessly drag the next. Whatever the case, if you are looking to experience a bit of high school nostalgia, appreciate thoughtfully developed characters, and/or enjoy an inside peek into the life of prep-schoolers, enroll in Sittenfeld’s Prep.